Italy is known for many important churches. There are about 200 churches in Venice, 100 of them in the Centro Storico (main island) alone. Many of the churches of Venice are absolutely worth seeing. 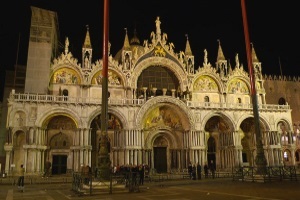 By far the best known church is St. Mark's Basilica on St. Mark's Square in the heart of the city. In the following article we would like to briefly introduce some churches. The following words in Italian are helpful when visiting the church: la chiesa (the church, plural: chiese), la basilica (the basilica), la cattedrale (the cathedral), il duomo (the cathedral), il campanile (the steeple), la campana (the bell). It is one of the most famous churches in the world. The cathedral is almost 1,000 years old (11th century) and is built in the Byzantine style. The ground plan is in the shape of a cross, St. Mark's Cathedral has five huge domes. The interior of the church is rich in art treasures. World famous are the "4 Horses of San Marco", a large bronze sculpture. You can reach St. Mark's Square with St. Mark's Basilica from Venice train station in about 45 minutes by foot or faster by water bus. The cathedral is open every day from morning until early evening. On Sundays during the chirch service you can not enter the cathedral as a visitor. There is no entrance fee to St Mark's Basilica. But you pay some Euro for extras as the ascent of the tower or for the visit of the treasury. The St. Mark's Basilica as well as the St. Mark's Campanile belong to the top 10 sights of Venice. The "Santa Maria Gloriosa dei Frari" is a beautiful, large church (basilica) in the middle of the historic old town in the district of San Polo. Interesting are some paintings in the basilica made of brick, among others by the famous Venetian artist Titian from the 16th century. Titian is also buried in the Frari church. The famous monument Scuola Grande di San Rocco is in the immediate vicinity of the Frari church. The building is only 10 to 15 minutes walk from Santa Lucia railway station. Frari was built, as some say, in the first half of the 14th century. In addition to Titian's paintings such as "Pesaro Madonna", some paintings by Giovanni Bellini such as "Madonna with Child" are among the outstanding works of art in the Frari Church in Venice. As far as we know, the Frari Church is open all year round. The entrance fee for adults was three euros when we visited the church at the beginning of 2019. Opening hours about 9 o'clock to 17:30, except for church services or similar (Sunday come in the afternoon). You can rent an audio device. The visit and the entrance fee are worth it. >>> The Brotherhood of San Rocco, close by. Quite a few experts rank this building among the 2 to 3 most important churches of Venice. It is a monastery church of the Dominican Order. The basilica is located in the eastern part of the main island of Venice in the district Castello, about away from many other important sights. The gigantic building (length almost 100 meters) is the largest of the many churches in the Gothic style in Venice. For centuries, the San Zanipolo church served as a burial place of many important Venetians, also of more than 20 Dogen (heads of state) of Venice. San Zanipolo is the church preferred by the locals in Venice called. The official Italian name of the basilica is Santi Giovanni e Paolo. To our knowledge, you pay 3 euros to enter and admire the interior of the church of San Zanipolo (worth it). Opening hours: mostly 7:30 to 18:30. On Sunday two masses take place in the church San Zanipolo at 9 o'clock and 11 o'clock. Otherwise there is a church service almost every evening at 18:30. This is an important sacred building in the north of the main island of Venice in the district of Cannaregio. This church was also built in the Gothic period and was opened exactly in 1400. Some elements on the outside of the Madonna dell'Orto church were not completed until the middle of the 15th century. A sight worth seeing in the parish church are famous paintings as by Jacopo Tintoretto or by Jacopo Palma (both 16th century). One can walk from the train station in about 30 minutes to the Chiesa della Madonna dell Orto. This beautiful church is built at a very conspicuous point. It is directly at the entrance to the Canal Grande Venice opposite the Piazza San Marco. Santa Maria della Salute is a baroque building built in the 17th century. It is the life's work of Baldassare Longhena, who built the Baroque church for many decades. Interesting are the marble floors and, as in many churches in Venice, the paintings of the artist Titian. 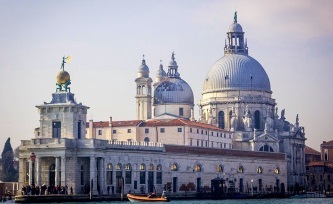 The Santa Maria della Salute is a so-called votive church. It was built to ask God for help against the plague. The plague was a great plague in Venice and many other parts of Europe in the 17th century. The other so-called Votiv church in Venice was also built because of the plague. In 1575 there was a serious plague epidemic in Venice, in which about a quarter of the population died. The church of Il Redentore was built on the island of Giudecca. 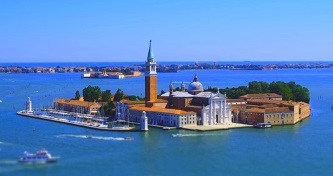 The island is a few hundred metres south of Venice's main island and can be seen from St. Mark's Square. The building was built in 1576, after the end of the plague, in thanks to God. The architect was Andrea Palladio, who did not live to see the completion in 1592. The Il Redentore is a church with a dome, which has a great optical effect especially from a great distance. Also in this church you can find some important paintings by Francesco Bassano. The wax heads in the sacristy are also interesting. This house of worship is built on a tiny island of the same name, Giorgio Maggiore, clearly visible from St. Mark's Square. This church is world famous for its ancient fa�ade and some paintings such as the famous Tintoretto Communion. Among the tourists is also a lift ride to the bell tower very popular. From above, one has a great view to Venice. More about the church Chiesa di San Giorgio Maggiore on this page. Now an incomplete list of further churches in the old town of Venice sorted by the 6 Sestiere (districts of Venice). San Giacomo di Rialto: A very old church, probably from the 11th century. Interesting is the large clock in front of the entrance from the 15th century. San Giovanni Elemosinario: Behind the Rialto Market Venice. Worth seeing are the altar paintings, especially the painting "The Saints Catherine, Sebastian and Rochus" by the painter Il Pordenone (1484 to 1539). There has been a church on the site since the 9th century. Church of San Polo: Important church with some magnificent paintings, also from the 9th century, but often rebuilt. Among the outstanding works of art are the paintings "Last Evening" and "Assumption of Mary and Saints" at the altar. An art treasure can be discovered in the Crucifix oratory next door: 14 paintings by Giandomenico Tiepolo, a kind of picture story of the 15th century cloister of Jesus. Santa Maria dei Miracoli: Great church with a white marble fa�ade, very popular with tourists. Also in the interior marble and some interesting statues among others by Tullio Lombardo and Alessandro Vittoria. The church of Mircaoli was built in the 15th century. More information about the building on our page about Cannaregio. San Marcuola: Church building almost directly at the Canal Grande Venice. Also here a picture of Jacopo Tintoretto with the topic Communion is the highlight. Scalzi Church: Larger church not far from Venice Central Station. The real name is Santa Maria di Nazareth. The building goes back to the Order of the Uncovered Carmelites. Without shoes, barefoot, means "scalzi" in Italian. That is why the church building is called "Scalzikirche" by the Venetians. Beside the Scalzi church is also the Scalzi bridge, one of the 4 bridges over the Canal Grande in Venice. Santa Maria Formosa: This church is located far east of Venice, the Sestiere Cannareggio is quite large. Inside you can admire some great works of art like "Pieta and Saints" (Palma il Vecchio). The origins of this church date back to the 7th century. San Michele in Isola: Great church on the cemetery island San Michele. The whole island with the cemetery is a popular sight. One of the most famous is a sculpture by Giusto Le Court. One reaches the island San Michele from Cannaregio (North Venice) in less minutes with the water bus. San Giacomo dall'Orio: Interesting in this church is the tomb of Giovanni Battista Pittoni, one of the greatest Baroque painters (born 1687 in Venice; died 1767 Venice). In the church you can find some great paintings like the Sermon of John (Francesco Bassano) or Sacra conversazione (Lorenzo Lotto), both paintings are from the 16th century. San Simeone Piccolo: For very many visitors to Venice, the first church they see. It can be seen from the central station of Venice directly on the other side of the Canal Grande and already at the main exit of the station. The Ciesa San Simeone Piccolo is mainly known for its rare round shape. San Bartolomeo di Rialto: This Ciesa (church) is only 50 meters away from the famous Rialto Bridge Venice in the direction of San Marco. It is a little inconspicuous between the houses. The church used to be a meeting point for the many pious, German-speaking merchants in Venice and is only about 200 metres old. Inside you can admire some sculptures by Jacopo Palma and others. The very well-known picture of Albrecht D�rer "Rosenkranzfest" was for a long time the great work of art in the Ciesa San Bartolomeo. It is now in a museum in the Czech Republic. Chiesa di San Salvador: Larger church between the Rialto Bridge and St. Mark's Square in the Sestiere San Marco. Here are some very important paintings like "Annunciation" by Titian or "Christ in Emmaus" (Giovanni Bellini, possibly copy). The church of San Salvador dates back to the 12th century. Since almost every tourist in Venice is often in this area in the Sestiere San Marco, the church is often well visited. The altar made of silver is also a sight of interest. Chiesa di Sant'Antonin: Interesting church building far away in the less touristic east of the old town of Venice in the middle of the big sestiere Catello. A church already stood here in the 7th century, but it was rebuilt several times. Today, many Venetians still tell a 200-year-old story. At that time, a winged elephant ran into the church Sant'Antonin and was shot in the building. Many church visitors marvel at the ceiling picture of Sebastiano Ricci and the pictures of Alessandro Vittoria in the chapel. Sant Elena: Only a few tourists come so far to the east of Venice, this church building is in the very east, clearly more than one hour on foot away from the central station. We have written our own page about the area Sant Elena, you can find it on this link. Chiesa di Santa Maria della Visitazione: Church building with a beautiful Renaissance fa�ade in the very south of the old town. Some important pictures like the "Pentecost miracle" above the altar of Alessandro Varotari (17th century) or "The crucifixion of Nicolo Renieri are still in the church. Even more famous works of art have been removed from the church, e.g. the organ doors of Titian are now in the USA. Santa Maria del Rosario: This church is in the neighborhood of the Santa Maria della Visitazione described above and is considered as its successor church of the Dominicans. The ceiling fresco by Giovanni Battista Tiepolo (3 pictures on the theme of Saint Dominic) can be admired. Very famous in the Santa Maria del Rosario is also the painting "Crucifixion" by Tintoretto. San Sebastiano: Another church in the middle of the Sestiere Dorsoduro in the south of the Venetian old town. The museum for all who are interested in the painter Paolo Veroneses (16th century). A large part of his life's work is in the church Chiesa di San Sebastiano. His paintings by Veroneses can be found on the walls, on the ceiling and above the altar. One should not miss, for example, his painting "Coronation of the Virgin Mary" on the ceiling of the church. Despite the length of the article these are by far not all churches in Venice. There are about 100 churches in the old town alone. Torcello Church: This is the oldest church in Venice and the highlight of the small island north of the old town. Church Burano: Here the church of San Martino is an important sight. Church Giudecca: On this island there are next to the very famous Saviour Church Giudecca some other places of worship.